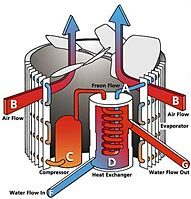 During heat pump operation, liquid Freon from inside the unit is pumped through the system (A) and is turned into a heated gas. This happens when heat is taken from the surrounding air (B) as it is drawn through the evaporator by the fan. The compressor (C) receives this warmer gas and it compresses it to a higher pressure, resulting in the Freon reaching even higher temperatures. As the unit sends the heated gas through the heat exchanger, the gas gives up its heat to the surrounding water (D). The Freon is then reverted to its liquid state which completes the cycle (A). The water (F), which is being forced through the heat exchanger (D) by your pool pump, is heated by three to five degrees as it passes through the heat exchanger. The water, now warmer, then flows back into your pool (G). Summit heat pumps offer excellent energy efficiency and industry-leading quiet operation. Locating plumbing connections on the back of the the unit for unobstructed access, makes installation fast and easy and a standard ultra-gold fin evaporator coil make it corrosion resistant – even in the harshest coastal environment. 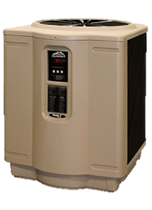 Summit delivers energy efficiency, superior value, performance and reliability. 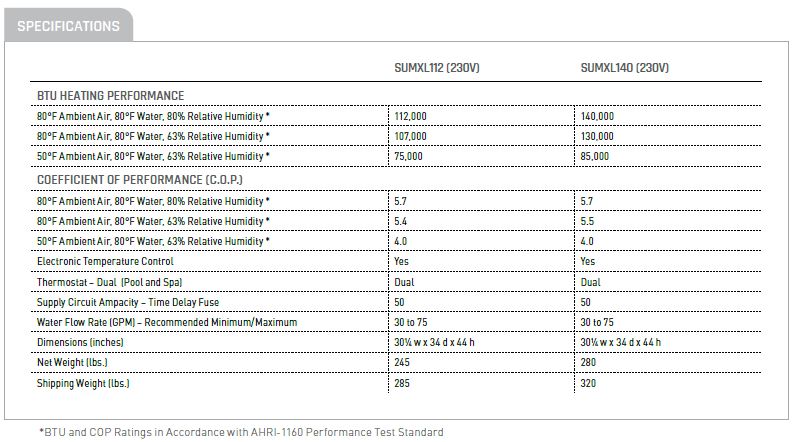 ** HPABG50A is the Aboveground Heat Pump Model which can be viewed from the Aboveground Heat Pump Section. Clearance Around the Unit- There must be a minimum of 2ft from walls, shrubbery, equipment etc. **Installation of this unit in a fully enclosed area (ie garage, shed) is NOT recommended! Hayward’s HP50B and HP65B heat pumps are the most efficient way to heat a pool up to 17,000 gallons. Hayward builds high performance, quality and reliability into every heat pump with a titanium heat exchanger, quiet operation and easy installation for years of swimming comfort. An electronic control maintains the desired comfort level while ensuring energy savings by maintaining the water temperature within 0.5 degrees. The exterior cabinet is injection molded of tough polypropylene for a lasting appearance that will not rust. For Aboveground Pools up to 17,000 Gallons. This heat pump is suitable for new installs and retrofit installations.